Shortly after apps on the Mac App Store and iOS App Store revealed Microsoft's fitness wearable, the company has revealed its $199 Microsoft Band fitness wearable to Re/code. The device will go on sale tomorrow at Microsoft's online and retail stores. The Microsoft Band is designed to last 48 hours on a single charge and can be worn all day and all night, as it tracks both physical activity and sleep. It includes 10 sensors that track standard health statistics like heart rate as well as unique points of data that other fitness bands do not track, like a UV sensor to measure sun exposure and galvanic skin response, which can identify stress. Like smart watches, the Band can also receive notifications from a user's smartphone. Microsoft is also launching a cloud-based health service called Microsoft Health, which can gather data from both the Microsoft Band and other fitness data gathering devices, like smartphones and other fitness bands. The service spans the web and multiple mobile platforms like iOS, Android and Windows Phone. The Windows Phone app, however, integrates Microsoft's voice assistant Cortana. The company also says that the feature set of device and services will grow, as users will be able to pay for things at Starbucks with the Band and will be able to see how certain events influence health or sleep. The company also notes that–if customers want to– Microsoft Health can combine work and personal data and gather insights such as how a big meeting with the boss affects that night’s sleep. Other features include access to Facebook and Twitter feeds, as well as weather and stock data. 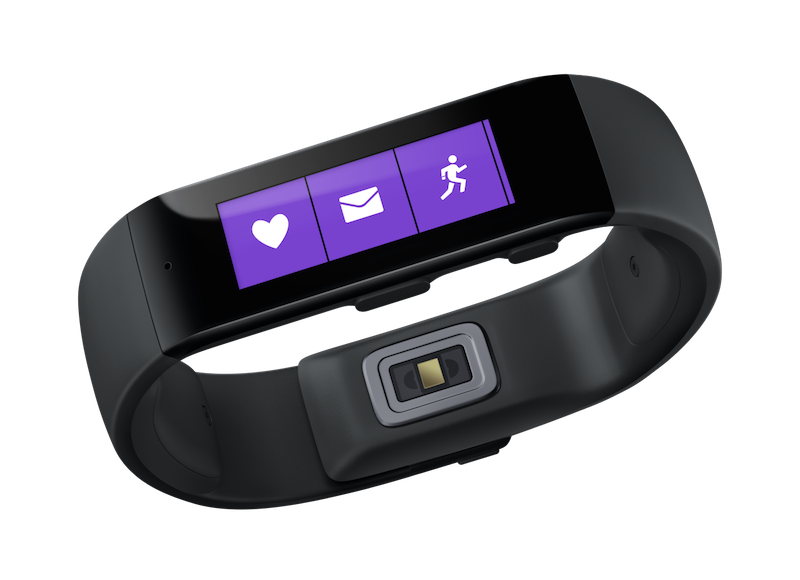 The Microsoft Band goes on sale tomorrow for $199. This is the type of device I wanted apple to release to be honest, something that gives me the time , quick glance of information , lasts more than a day , etc nothing too enturisive and big. Hope it works with Siri via the microphone ? If it does and I can text people via this band then it's a winner for me. Yes, more than the apple watch but does it have the same funationality? But at least they aren't wasting their time putting the photos app on a watch. I'd rather a smart watch be good at a few key things that a watch is good for rather than try to stuff it with all the apps on your phone. I'm interested to see how this turns out. My prediction is Microsoft can lay this in the ground next of Kin. I'm not sure you really want a lack of competitors to the Apple Watch if the Apple Watch is all you care about. A lack of competition is the reason why the iPad mini 3 only got Touch ID and not the A8X, laminated display, better camera, and 2GB RAM like the iPad Air 2. You want FitBit, Jawbone, Android Wear, and this Microsoft Band to all be very competitive products so Apple produces the best Apple Watch possible at a very affordable price. There's nothing worse than when a company rests on its laurels (especially price-wise) because the competition is lacking. That long battery life is because it doesn't do anything! If this is the best that the new Microsoft CEO can do it is laughable! Microsoft is so bad a Marketing it is not even funny! LOL! Who is their Ad agency? no...i'm not going to get Zune'ed out again. biggest mistake I've ever made. Looks better than the hideous apple watch. It's like the Pebble. My Pebble battery lasts a week because it doesn't do anything. Agreed. This device is actually really nice. I might get one to pair with my iPhone 6 Plus.